Consider your property and to whom it should belong at your death. These decisions are the heart and soul of any last will and testament and merit time and energy. Assemble a complete list of your property -- real estate; savings, checking and investment accounts; personal property including jewelry; other holdings of monetary or sentimental value -- then determine appropriate heirs for each item. Most states impose no restrictions on your choice of heirs; a few mandate bequests to minor children. Review the form will. Blanks in the early paragraphs require identifying information. Fill in your name, address and other data. Use a pen or a typewriter. Fill in the asset/heir section with the list you prepared in step 1. Identify property carefully to prevent ambiguity; describe heirs by full name and address. Select and insert the name of a "residuary beneficiary" to inherit any items you failed to bequeath specifically. Consider whether you wish to condition one or more bequests on the heir(s) surviving your death (not dying before you do). 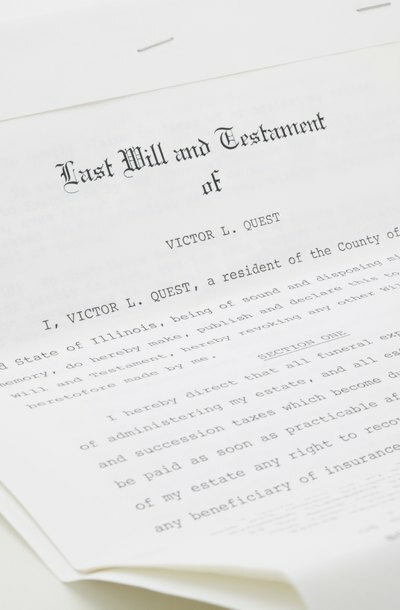 If so, state the condition beside the bequest and name an alternative beneficiary to inherit that item of property in case the condition is not met. Name a guardian for your minor children in the appropriate blank. Name a person to administer your will where the form asks for the name of an executor. The executor gathers your assets, pays your bills and distributes your estate according to the terms of your will. Execute your will. Assemble two adults who are not named as heirs in your will. Inform them that you are signing your will, and sign and date the will in their presence, then ask them to sign and date it as well. Some states do not allow a spouse to serve as a disinterested witness, whether or not he stands to inherit under the will.